Well hello people! 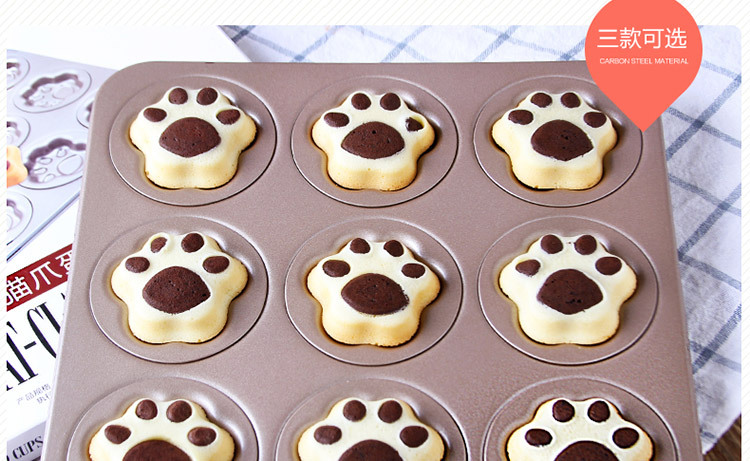 It's a brand new year, and I've taken the plunge (end of last year) and bought a new oven off taobao.com (along with some cute cake molds). So, here's my first baking post for the year of 2017, and hopefully many more to come! Upon seeing this cake mold, I just carted it without any 2nd thought. Fretting over which cake to bake comes only after the mold got delivered. HAHA! And anway, for my 1st try at my own paw cake, I decided to try out a Castella (kasutera) cake, which is a Japanese honey sponge cake. First up, crack your eggs into a clean, heat-safe bowl and beat with a mixer on high until the egg mixture turns frothy, then add in your sugar in 3 additions, beating in between each addition. Then, place your egg mixture over a pot of simmering water and continue beating on high. Remove the egg mixture from heat when it has warmed up to our body temperature and continue beating on high until the mixture thickens, double in volume and turns into a pale yellow colour, which is the ribbon stage. Check if your batter is ready by lifting up the batter and letting it drop back into the bowl. It should drip down SLOWLY like a ribbon and the ribbon pattern doesn't disappear back into the bowl immedaitely. It should take at least 10 minutes for you to reach the ribbon stage, so just whisk away! While beating your eggs into ribbon stage, warm up your milk (I just stick the milk bowl into the hot water after I removed my egg bowl) and dissolve the honey into the milk. Drizzle the honey-milk mixture into the egg mixture and beat on low until just combined. Sift in 1/3 of the flour and mix until just combined. Continue with sifting in the remaining flour and FOLD until just combined. If you're not confident of your folding skills, I highly recommend folding using a hand whisk instead of a spatula as it allows for a more even mixing, hence you're less likely to over-fold your batter. Then, take out about 3 tbsp of the batter into a smaller bowl and add in 1 tsp of unsweeten cocoa powder. Mix until just combined and pour into a small piping bag. Pipe the chocolate batter into the depression in the mold that makes out the "fingers" of the paw and bang the mold lightly on the counter. If it doesn't spread well or you've messed up, do not worry. Just go in with a toothpick to even out the batter or clean up any mess. Spoon about 1.5 tbsp of the white batter into each paw, on top of the chocolate batter and tap your mold against the counter for a few times to remove any air bubbles. Bake at 170 degree Celsius for about 15 minutes or until the top of your cake has turned brown. As it's my first bake with this oven, I couldn't really grasp the temperature and baking time very well and mine ended up slightly overbaked and they tasted more like Kueh Bahulu. These are coolness and so cute! Made me want to bake soonest. Checked our pantry and I need a few ingredients to create those surely delectable mini cakes. And surely as well, my boys would rave about those cute paws. Ihihihi. Such a cute mold! Would love to taste it out. I'd try the recipe too but probably on a different mold. But I only bake occasionally so I'll just stare at your yummy creation. Since it is the first time, you are forgiven. Besides, they look so cute. :) But I am curious. How did it taste? aww looks so yum. you made me hungry, haha!